Nuclear energy is energy from the nucleus of atoms. There are two types of nuclear energy. The first type is nuclear fusion energy. In this type of energy atoms are fused together to form new atoms. This fusion causes a large amount of energy to be released. 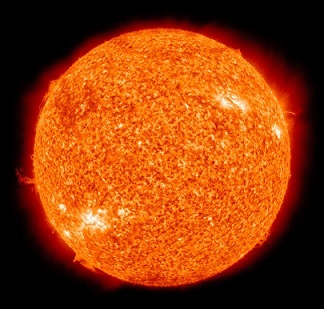 The sun is an example of a nuclear fusion energy source. The extremely large mass of the sun causes gravitational contraction, which causes a large amount of pressure to be exerted on the atoms inside the core of the sun. This very high pressure generates very high temperatures in the core, on the order of millions of degrees. This extremely high temperature then causes hydrogen atoms to fuse into helium atoms, and in doing so energy is released which is then radiated out into space, some of which reaches earth. Simply speaking, the sun is a large fusion reactor, and it is responsible for all life on earth. It is 4.6 billion years old and it will continue to shine for about another 8 billion years. Scientists are researching ways to produce nuclear fusion here on earth. If they ever succeed it will be an inexhaustible, very abundant, and very clean source of energy. The second type of nuclear energy is nuclear fission energy. This is the energy that we commonly use here on earth to generate electricity. This type of energy comes from splitting atoms which releases a large amount of energy as a result. This energy is typically used in nuclear power plants to heat water and produce high-pressure steam. This high-pressure steam is used to run large turbines which generate electricity. 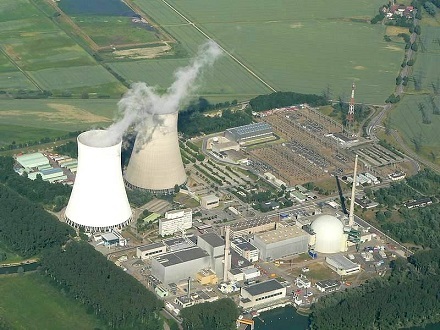 The picture below is of a nuclear power station. Like nuclear fusion, nuclear fission is also an abundant source of energy, and it produces no harmful atmospheric emissions like burning fossil fuels does. But unfortunately it produces very dangerous radioactive waste, which must be treated with great caution when disposing of. Doing this is a very expensive and resource intensive undertaking which is why many are trying to get society to move away from nuclear electricity generation. Nuclear fuel such as Uranium (used in nuclear fission), has the primary advantage that it is millions of times more energy dense than fuels such as gasoline. This means that if a car was running on a full tank of nuclear fuel instead of gasoline, it would be able to travel millions of times farther! Nuclear power plants utilize nuclear energy in a gradual and controlled way. 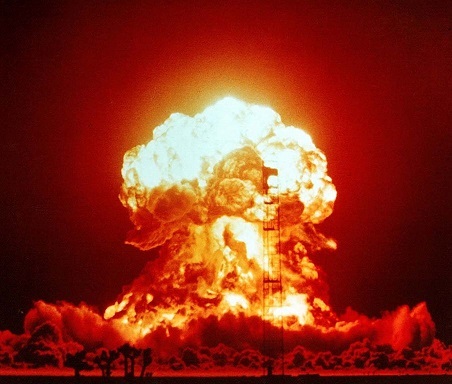 But here is a picture of nuclear energy being released in a sudden and very powerful way. This is a nuclear bomb exploding. It is the most powerful type of bomb in the world.